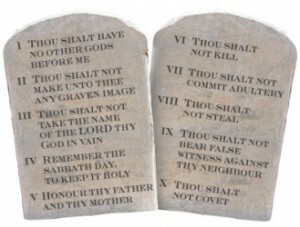 FARGO, N.D. — A Ten Commandments monument in North Dakota does not violate the U.S. Constitution’s Establishment Clause as it serves more as a historical display than a religious one, the 8th Circuit Court of Appeals ruled this past week. The monument had been donated over 50 years ago by the Fraternal Order of Eagles and sits in Fargo’s Civic Plaza, a public location in the city. Since 2002, the Red River Freethinkers have been fighting against the presence of the monument, asserting that it serves as a government endorsement of Christianity. According to reports, the organization had proposed an adjacent monument describing religious freedom,Fargo’s Board of City Commissioners rejected the idea. It instead decided to appease the Red River Freethinkers by moving the display to private property. However, a number of residents disagreed with the notion, and petitioned for an ordinance that would grandfather in the monument. “A marker or monument on City of Fargo property for 40 or more years may not be removed from its location on City of Fargo property,” it read. The City Commissioners soon adopted the ordinance, and also forbid any new monuments from being erected in the plaza. Because of this, in 2008, the Red River Freethinkers sued the City of Fargo in federal court. The lawsuit was initially dismissed for a lack of standing, but the determination was overturned in 2012 by the 8th Circuit Court of Appeals. After the lower court consequently reviewed the case, it ruled that the monument presented no constitutional violation. This past week, the 8th Circuit Court of Appeals affirmed the ruling, 2-1, stating that the display served more as a historical feature rather than a government promotion of Christianity. It pointed to the 2005 ruling in ACLU Nebraska Foundation vs. City of Plattsmouth, Nebraska, which upheld a Ten Commandments monument due to the U.S. Supreme Court’s decision in Van Orden vs. Perry, decided that same year. “Like the Ten Commandments monument at issue in Van Orden, the Plattsmouth monument makes passive—and permissible—use of the text of the Ten Commandments to acknowledge the role of religion in our nation’s heritage,” the court quoted from the Plattsmouth ruling. It also noted that there were both sacred and secular reasons behind the monument’s establishment, and that it contained more than just Christian text, such as an American flag and an “all seeing eye” pyramid. The Red River Freethinkers is now considering whether to appeal the matter to the United States Supreme Court.